Hope everyone had a nice Christmas, has found time to recover from too many treats, and been able to clean up the decorations. 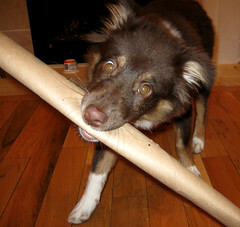 Here is a photo I took of our dog with the tube from a roll of wrapping paper. He thought it was an excellent present, but it did not last very long.